Hutchison, Anders & Hickey, in Tinley Park, Illinois, is a versatile, hometown law firm that solves the legal problems of its clients throughout Will and Cook counties. We have been a part of Tinley Park civic and business life for more than 40 years, and our dedicated legal team extends the firm's tradition of providing high-quality legal services for a reasonable cost. 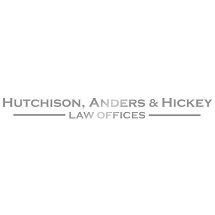 While many law firms specialize in serving a particular type of client, Hutchison, Anders & Hickey takes pride in being able to help almost anyone who walks in our door. Our general practice law firm represents clients in the areas of personal injury, divorce and family law, business and corporate law, civil litigation, estate planning, workers' compensation and bankruptcy. Over the years, Tinley Park has grown from a small community to a burgeoning suburb of Chicago. Our law firm has changed with the times. Today, we serve more clients in a broader geographical area. However, we have also maintained our relationships with our clients and our willingness to listen to their concerns. Retain us, and you can expect to be paired with an attorney throughout your legal matter, treated with kindness and respect by our staff, to be educated about your legal concern prior to making decisions, and remain informed on developments concerning your issue throughout the legal process. At Hutchison, Anders & Hickey, we work hard to provide value for our clients' legal investments. Our goal is to be your law firm today and your law firm in years to come. Whether you need to resolve a family law issue, obtain a divorce, start a business, complete a real estate transaction, create an estate plan, or secure compensation after a car accident, we can help you. Our long-serving legal team provides legal advice and representation in personal injury, divorce and family law, business and corporate law, civil litigation, estate planning, workers' compensation, bankruptcy and other situations. We assist clients in divorce, child custody and visitation, child support, paternity, alimony, property division and other family related legal matters. We assist businesses with entity formation, general business advising, drafting and reviewing documents, nonprofit organization representation, real estate transactions, litigation and more. We help client to recover compensation following motor vehicle accidents, premises accidents, medical malpractice, product accidents, and workplace injuries, among others.